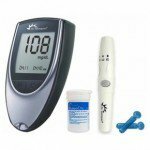 Snapdeal Selling Dr. Morepen Bg-03 Blood Glucose Monitor + 25 Strips Rs. 445 Only for Bangalore or Rs. 545 for other cities.